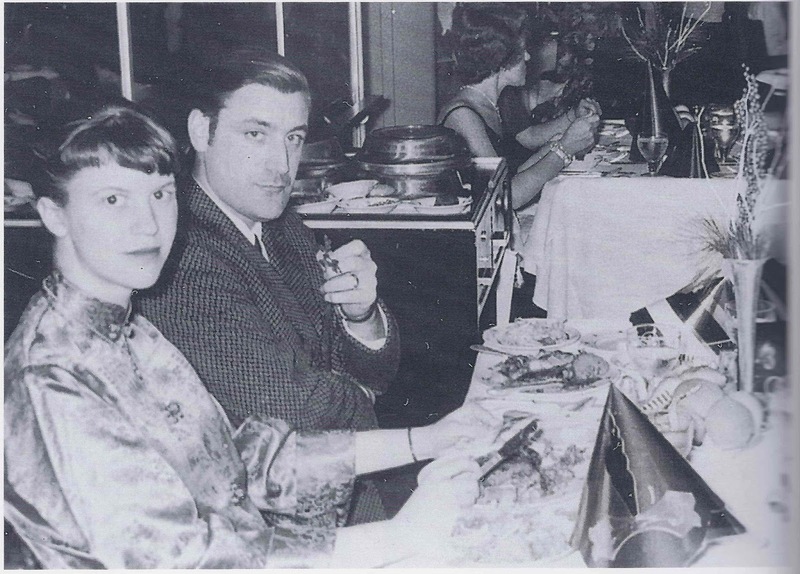 Maev Kennedy wrote in today's print edition of The Guardian about the forthcoming Bonhams auction: "Writers' Lives: Auction offers intimate glimpses inside the marriage of Plath and Hughes" (pg 7). The article, though, posted online yesterday. 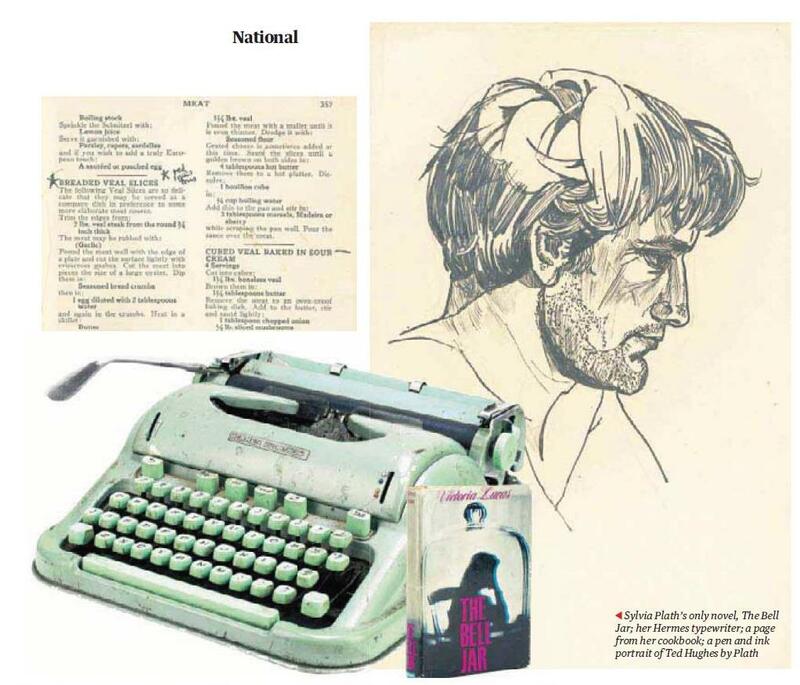 It's safe to say in the Sylvia Plath and Ted Hughes realm, the news went viral. Frieda Hughes is set to auction about 108 lots of items from the estates of Sylvia Plath, Ted Hughes, and Olwyn Hughes that she inherited. The range of items is breathtaking for peanut-crunchers and collectors, archivists, and librarians. Clothing, jewelry, personal library books, typescripts, and realia such as furniture. The items reflect the lives of, at a minimum, Sylvia Plath, Ted Hughes, Frieda Hughes, Nicholas Hughes, Olwyn Hughes, William Hughes, Edith Hughes, Otto Plath, and Aurelia Plath. When I learned about the auction in December it was really hard to obey the request for confidentiality. But, I did it! When I saw the early catalogue last, which was honored to proof and to edit, I was practically hyperventilating. I have been given the go-ahead to post a few of them here. However, please keep in mind this is early, and titles, descriptions, and maybe even pricing is subject to change. The full catalogue will be available about a month before the 21 March 2018 auction date. Are your appetite's whetted? Start saving your pennies! All links accessed 24 January 2018. 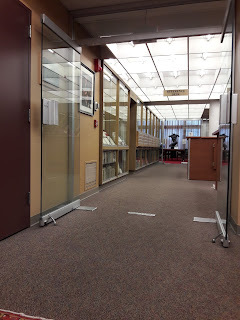 Recently I visited the Gotlieb Archival Research Center at Boston University which is really close to my work. The reason I went there was that they have the papers of Susan Fromberg Schaeffer who knew Ted Hughes, Olwyn Hughes, as well as to a lesser degree Frieda and Nicholas Hughes and Carol Hughes. In 2006, Schaeffer (1941-2011, obituary) published a novel called Poison which is about the most apt name possible for this labored, lumbering 608 page thing. It is a trial to read it, but it is of interest as the novel is loosely based off of the story of Sylvia Plath and Ted Hughes, as well as the death of Ted Hughes and the 2002 legal battle over Hughes' will. The story is of Evelyn Graves (Plath) and Peter Grosvenor (Hughes), of Elfie (Assia Wevill), Sigrid (Olwyn), Sophie (Frieda), Andrew (Nicholas), Meena (Carol), Penelope (Dido Merwin), Julie (Susan Fromberg Schaeffer), and Clare (the woman with whom Hughes was reportedly involved with when he passed away). There are some Evelyn Graves/Sylvia Plath details in the novel that are so specific that it does make you wonder what coloring Schaeffer provided as she wrote, or if in fact it is actually something closer to the straight truth. A couple things that immediately come to mind are the suicide preparations Evelyn Graves took in her flat, Evelyn's suffering a miscarriage after being hit by Peter Grosvenor related by Penelope, and a brief scene that sort of depicts "Last Letter". Of course there is much more because the other people portrayed are undoubtedly the victims of private information provided under the guise of friendship being made public. Poison represents a betrayal of the highest magnitude. I was curious to see if there were letters from the Hugheses to the Schaeffers, to see if there were research notes on Poison that might have recorded conversations, and the like. I did not find anything like this. This is not to say they are not in the collection: I am unfamiliar with how Schaeffer worked. The period in question here, 1999-2002/3, is right when laptops were becoming more and more of a thing, so it might be that she took notes on the computer. I do not think BU had electronic files. I found four letters from Ted Hughes, five letters from Olwyn Hughes, and one letter from Frieda Hughes. Below is a list of letters with brief annotations about their locations in the collection and their contents. From Box 49, Folder 9, ALS, blue aerogramme letter, postmarked 29 June 1983, North Tawton, Devon: Offering to help them find lodgings on an upcoming visit to England, mentioned a garden flat in London where Nicholas Hughes lived. Briefly mentioned paperbacks of his books. From Box 49, Folder 9, ALS, blue aerogramme letter, postmarked 28 July 1983, North Tawton, Devon: Giving directions from Heathrow to Court Green and a stay at their farm cottage. Mentions his forthcoming trip to Africa to visit Nicholas, and that an adaptation of Letters Home on the T.V. that night. From Box 49, Folder 9, ALS, blue aerogramme letter, postmark date illegible, North Tawton, Devon: Mentions a cottage to rent in Zennor that's next door to where, at different times, D.H. Lawrence and Katherine Mansfield lived. From Box 49, Folder 10, ALS, white paper, no envelope: Apologizing for silence following 1987 Janes Anderson/Bell Jar trial and discusses Linda Wagner-Martin's biography and that Anne Stevenson wants to write one, too. Discusses other things. From Box 48, Folder 13, ALS, postcard with enclosure, envelope postmarked 6 February 1999: Thanking Schaeffer's for their kindness following the passing of her brother, saying "I've been totally desolate-- a hard time." Later Olwyn Hughes send the Schaeffer's a programme from the Ted Hughes memorial service at Westminster Abbey (held in Box 48, Folder 12). From Box 48, Folder 14, ALS, card, envelope postmarked 9 August 2002. Card design: Brushstroke by Hiroshige. About the brewing legal controversy between Carol Hughes and Frieda and Nicholas Hughes, mentions publication of Waxworks. From Box 33, Folder 16, TLS, 3 pages: Reading Poison and taking much exception to it: "I'm reading POISON – in bits – as much as I can stand at a time. It has made me ill. I considered you and Susan good friends so the book is nightmarish.." A very colorful letter, full of Olwynian venom, correctly placed, and offers some factual corrections. From Box 33, Folder 15, ALS, postcard, JMW Turner, Venice, the bridge of Sighs: Ending friendship because of Poison which she called an "infantile willful atrocity". Box 33, Folder 9, ALS, 3 pages, no envelope: Written from Wooroloo. About the move, setting up, life, paintings, children's books. There are several drafts of Poison and I flipped through one of them but was just trying to get an understanding of what was there and frankly, I do not really want to spend more time on that book than I have to! The first draft of the novel appears to have been completed in May 2003 with the first revisions completed in May 2004. Revisions continued into July 2004 and September 2004. The collection also has page proofs of the book from 2005. If you are interested in this, I strongly suggest referring to Jonathan Bate's Ted Hughes: The Unauthorised Biography. See pages 302, 432, 548-52 of the US edition. The range of pages 548-52 relate specifically to Poison. See also Luke Ferretter's review "A Fine White Flying Myth of One’s Own: Sylvia Plath in Fiction – A Review Essay" published in Plath Profiles (2009). One of the more interesting documents I stumbled on was Schaeffer's copy of her Affidavit re: Anderson v Avco Embassy Pictures in box 19. Schaeffer submitted the following: "real people inevitably become the inspiration for my fictional characters. Some traits of theirs impresses me, and soon a cocoon of imaginings wraps itself around this kernel. In the end, a single fictional character is really a crowd of people, some real, some imaginary, each of whom contributes some piece to the single fictional whole. Since The Bell Jar is a work of fiction, I am certain that Sylvia Plath also created her characters in this way." The collection started to be acquired in 2005 and had several annual accretions in 2006, 2007, and 2008. It is unprocessed, but there is a preliminary finding aid available for it on site only. Bizarrely, Boston University does not publish their finding aids. I wish they did as even in its current, preliminary state, the finding aid has a lot of information that would help with people discovering it. A case is point is that when I arrived the Director asked me why I was interested in the collection, stating openly that there has been quite little interest in the Schaeffer papers before. It is a case where the obvious solution (publishing the finding aids) may be the most difficult to enact because of resources. This is perfectly understandable, however, they could always get student interns from BU itself, or from the library school at Simmons, to assist with preparing the documents for the web. Oh, and discovery and use. Put a PDF online and let Google do the rest! There are letters from many other famous writers and poets, and even one (that I saw) from Stanley Kubrick. Frustratingly, they make you wear white cloth gloves while working with the papers. This is not smart as you cannot feel the papers as you are flipping through them and increases the likelihood that you may rip one. Gloves are fine for photographs as you do not want the oils on your skin to transfer to the photographs, but with paper? With paper that is housed in folders and boxes in temperature and humidity controlled storage? No, this is not good. It also makes it difficult to type (and they do not allow photography). The staff was all nice and helpful, though strangely at least two of them were loudly eating in the reading room behind their desks. All links accessed 17 January 2018. Yesterday was one of those Janus January days. Cloudy, windy, unseasonable warm and rainy in the morning, but by noon, the temperatures plummeted, the clouds pushed off and rain water froze seemingly instantly. I had to go to Logan Airport, and so I felt it would be a good day to use the new Ricoh Theta camera I got last month from Brandi. And O!, was I glad I went. That blue sky is amazing... right out of "The Colossus": "A blue sky out of the Oresteia / Arches above us" (The Colossus, 1960, p. 20). Or, this recalls Plath's own visit to her father's grave from March 1959, written in her journals: "A clear blue day in Winthrop. Went to my father's grave, a very depressing sight" (The Journals of Sylvia Plath, 2000, p. 473). Plath mined this experience for use in The Bell Jar, published on this day 55 years ago in London. But she changed the scene from that which she recorded in her journals. The beach behind Johnson Avenue, showing Deer Island, Logan Airport, and Downtown Boston. This was the beach that Plath wrote about in her short story "The Green Rock" and her poem "Green Rock, Winthrop Bay". 92 Johnson Avenue, the Plath House! The side of 92 Johnson Avenue, you can see some of the study windows Plath's mentioned in her poem "The Disquieting Muses". Yirrell Beach, showing the Water Tower, taking from the walking trail that goes around the perimeter of Dear Island. 892 Shirley Street, the house of Aurelia and Francis Schober, Plath's maternal grandparents. Yirrell Beach, showing the Water Tower again, and the beach, and a bit of Dear Island. Many of these images look really cool in the "Little Planet" view. Don't you think? I know, I know, I should be editing the Volume 2 letters and I am. Just taking a little break to write you! All links accessed 14 January 2018. Over the Christmas holiday I visited my family which is always really nice and they wanted to see the One Life: Sylvia Plath exhibit which is still on (through May 2018) at the National Portrait Gallery in Washington, D.C. I had donated a piece, so they wanted to see that, but also to see a little bit about Plath herself, too. They enjoyed the exhibit, and I think walked away with a greater appreciate for the poet, the artist, and the person (Plath, not me!). 1. | 2. | 3. | 4. | 5. | 6. | 7. Sorry that I am in so many of them; it is fortunate the camera did not break. Lastly, some more photos! I know many of you saw my first blog post on this back in July, but in that visit I had only my cell phone camera and I wanted shots on my more reliable Canon point-and-shoot. So here they are. I do hope as many of you as possible can visit the exhibit. It it wonderful to see these bits of Sylvia Plath assembled together from the collections at the Lilly Library, Smith College, and from a couple of "private" donors. I put private quotes because as the donor is listed on the exhibit labels that person is not necessarily private. All links accessed 26-28 December 2017 and 2 January 2018. On 24 August 2017, I put out a call for help in searching for articles on Sylvia Plath's first suicide attempt. Tim Clair of Plath Project came to the rescue! Searching a combination of web resources, he identified an article from Mount Pleasant, Iowa's newspaper the Mount Pleasant News. Tim shared with me his searches and queries and as a result, I signed up for newspapers.com and located a cache of additional newspaper articles from across the country. I also popped up to Harvard and found two additional newspaper articles from the Evening Star out of Washington, D.C., from one of their digital resources. 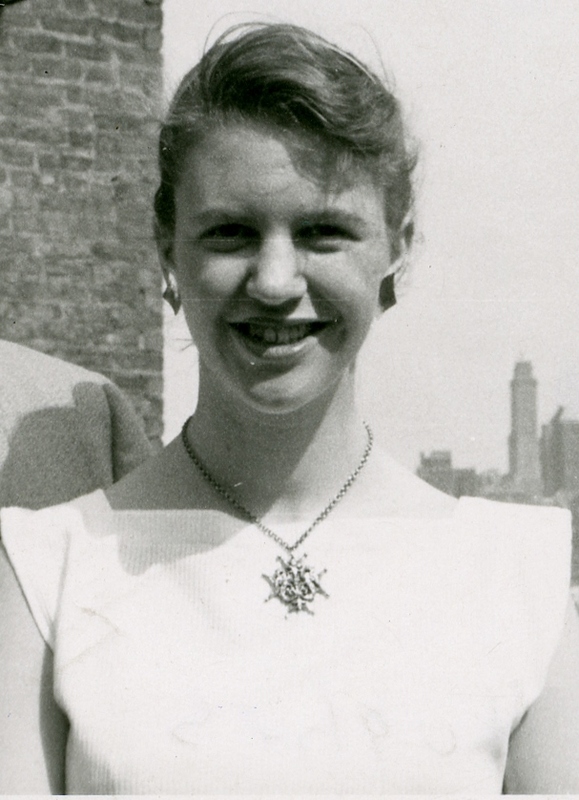 So in all, more than forty new articles on Sylvia Plath's first suicide attempt have been identified. This is incredible and please please join me in thanking Tim very sincerely for heeding the call. Below is a bibliography of those articles in order by date, and then by newspaper names. "Top Student Missing." Newport Daily News. August 25, 1953: 7. "Subject…" The Akron Beacon. August 26, 1953: 1. "Brilliant College Girl is Sought." Albuquerque Journal. August 26, 1953: 17. "Missing Student Found." The Cincinnati Enquirer. Kentucky edition. August 26, 1953: 11. "College Poetess Hunted in Woods." The Des Moines Register. August 26, 1953: 1. "Missing College Girl is Found." Des Moines Tribune. August 26, 1953: 8. "Missing College Girl, 20, Hunted in Massachusetts." Evening Star. August 26, 1953: A-2. "Smith College Poetess Object of Wide Search." The Holland Evening-Sentinel. August 26, 1953: 3. "Police in Greater Boston…" The La Crosse Tribune. August 26, 1953: 21. "Student Missing." The Miami News. Main edition. August 26, 1953: 1. "Student Missing." The Miami News. Broward edition. August 26, 1953: 1. "Searches Comb Woods For 20-Year-Old Girl." The Montgomery Advertiser. August 26, 1953: 10. "Missing Student Found." The Mount Pleasant News. August 26, 1953: 2. "Smith College Co-Ed Missing." New Castle News. August 26, 1953: 9. "Missing Student Found in Cellar of Her Home." The News Journal. August 26, 1953: 1. "Hound Joins Hunt for Girl." The Orlando Sentinel. August 26, 1953: 16. "Missing." The Pittsburgh Press. August 26, 1953: 4. "Girl, Honor Student in College, Missing." The Post-Standard. August 26, 1953: 1. "Missing Student Found in Cellar." Poughkeepsie Journal. August 26, 1953: 28. "Senior Found; Drug Victim." Albany Times-Union. August 27, 1953: 3. "Missing Co-Ed Found in Cellar." Albuquerque Journal. August 27, 1953: 17. "Smith College Girl is Found." Asheville Citizen-Times. August 27, 1953: 36. "Missing Smith College Senior Found in Cellar." The Burlington Free Press. Main edition. August 27, 1953: 2. "Missing Smith College Senior Found in Cellar." The Burlington Free Press. Other edition. August 27, 1953: 2. "Missing Girl Found Under Porch of Home." The Cumberland News. August 27, 1953: 1. "College Girl Found." Daily Press. August 27, 1953: 17. "Missing College Girl, 20, Found Under Home Porch." Evening Star. August 27, 1953: A-5. "Missing College Girl Found At Her Home." The Greenville News. August 27, 1953: 1. "Smith College Poetess Found Unconscious." The Holland Evening-Sentinel. August 27, 1953: 2. "Missing Honor Student Found." The Indianapolis Star. August 27, 1953: 24. "Missing Girl Poet Found Unconscious." Long Beach Independent. August 27, 1953: 12. "Missing College Student Found Asleep in Cellar." The Morning Call. August 27, 1953: 3. "Missing College Girl Is Found Semi-Conscious." The Montgomery Advertiser. August 27, 1953: 1. "Co-Ed Found." The Orlando Sentinel. August 27, 1953: 1. "Find Missing Girl Safe Under Porch." The Post Sentinel. August 27, 1953: 3. "Home All Along." Shamokin News Dispatch. August 27, 1953: 1. "Found." Star Tribune. August 27, 1953: 3. "Missing." The Tampa Times. August 27, 1953: 16. "Missing College Girl Found Under Porch Of Her Home." The Tampa Tribune. August 27, 1953: 6. "Will Recover." The Tennessean. August 27, 1953: 10. "Missing Girl Found Asleep in Mass Home." The Times. August 27, 1953: 9. "Missing Girl Found in Cellar." The Times Recorder. August 27, 1953: 1. "A Wide Search." The Ithaca Journal. August 28, 1953: 11. So, if you count them all, that's 43 new articles and brings the total up to 256! All of them are now a part of the bibliography of Articles on Sylvia Plath's First Suicide Attempt on my website for Sylvia Plath A celebration, this is, available with images of the articles and transcriptions. Enjoy! Thank you so much Tim!!!! All links accessed 28 August 1953, I mean 2017.